It finally Friday and you've got the recipe for a super relaxing weekend: the perfect weather, your favorite beverage, and our top photography blog posts from around the web. Enjoy. Congrats to WPC Team USA Member...Francie Baltazar Stonestreet! WORLD PHOTOGRAPHIC CUP: This article shines the spotlight on Francie Baltazar Stonestreet, one of the incredible photographers representing the United States in the World Photographic Cup, a world-wide event co-founded by PPA! 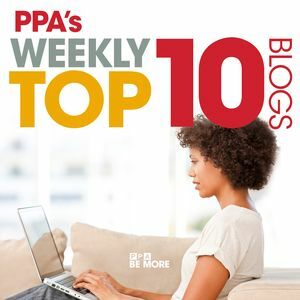 Get inspired by reading Francie's amazing story on PPA Today. SALES: You've got the skill and you're really looking into selling print products but you're still trying to figure out the best way to go about it. The author of this article has some tips and tricks on how to make remarkable In-person sales. COPYRIGHT PROGRESS: In order to help protect photographer's copyrights, Google has eliminated the "View Image" button, which formally enabled users to download images without visiting the host webpage. Read the full story on PetaPixel. DRONES: National Transportation Safety Board (NTSB) is currently investigating an aircraft crash which may have been caused by an illegally flown drone and this article has the details. You can also visit PPA.com/Drones to learn more about drone use and safety. CREATIVITY: You know that creativity is a key component of photography, but do you know how much your mindset impacts your creativity and ultimately, your works? Find out in this article! INSPIRATION: The unique and beautifully crafted "Anonymous Women" photo series has made headlines in recent times. Read about the inspiring story of Patty Carroll, the photographer behind the breathtaking images. MARKETING: Digital marketing has been evolving rapidly over the years and in order to take maximal advantage of the opportunities these platforms provide, it is imperative to keep up with the trends. Find out how online marketing might be different this year in this article. MIND BLOW: The image of a single trapped atom (that's right: one single atom) won the Engineering and Physical Sciences Research Council's (EPSRC) science-photography contest. Check it out and find out more in this article on DPreview. PROFILE: Kelly Tunney is not only one of Australia's premier wedding photographers but also a recognized speaker and photographic instructor. Read about her 20-year journey and the unique values she upheld as she made her way up on Professional Photographer. STUDIO: If you're considering designing a portrait studio in the near future, this photographer, who just designed a studio of her own, has some tips on how you can make a studio that you'd enjoy working in.